After this comes the Sharing which is the perfect way for you to build community. 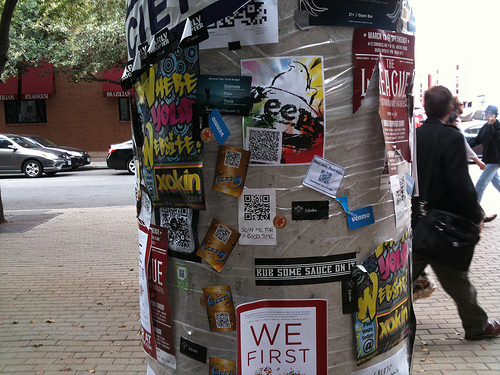 The great about QR codes is that you have no limit to how, or even how much, you can share with them. You can share everything, from video, to social networks accounts, fan pages, mobile apps, landing pages to items you want to sale. Using QR code to give people a hyperlink from offline world to online items greatly simplifies the process of typing long and forgettable URLs – it is all accomplished in one scan. QR Codes are essentially Call to Action things. Imagine you have already built a community, the next step is you have to take is to mobilize them to take action and engage with interesting stuff. You can use Dynamic QR codes to do that. They give you the option to direct people who scan to special offers by simply linking your QR codes to new landing pages so the QR codes stays the same and you change its content without the need to reprint it again. All types of QR codes you can create with YouScan.me are dynamic. Analytics is probably one of the best about QR codes. You can track the scans and demographics of people who scan, which is unavailable in other kind of print ads and marketing campaigns. We have built our generator in a way that every single click is tracked with location and you can view exactly how many people scanned any of your QR codes and where they are from. This useful analytics lets you estimate ROI even deeper and give you vital data about people who are engaged in your campaigns. Sign up for YouScan.me’s account here and create your QR codes for Free.